The book of Ruth is amazing story about providence, love, and redemption. It follows the life of Naomi and Ruth as they struggle through difficult trials. God is providentially looking out for them and arranging circumstances for their blessing unseen to them. 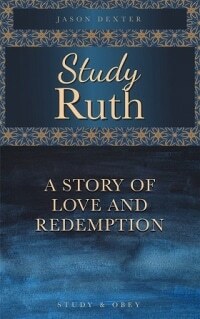 Although the book is titled “Ruth” it is just as much a story of Naomi. When her family leaves the Promised Land to escape a famine and things only get worse. Naomi loses almost everything and becomes embittered. But as she returns to her source in the land provided by God, her attitude starts to change. Boaz also figures prominently in this book and is a type of Christ, pouring out care upon Ruth. He selflessly puts others needs ahead of ours, just like our Savior. While the events in this story happened thousands of years ago, when you join us in our study you will discover that the principles inside are very applicable still today. We learn about communication, giving, love, providence, redemption, and courtship. Join with us and see how God may change your life through this study of Ruth! Each study contains outlines, discussion questions, cross-references, and teaching points which you can use for personal study or to facilitate a group. We hope you enjoy studying the gospel of Ruth in your own small group.